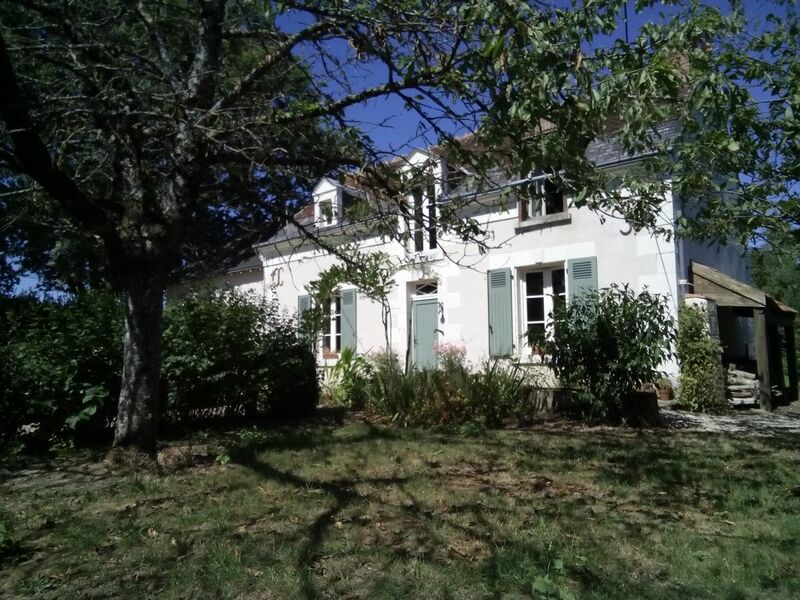 This 18th century cottage with large garden, is set in the vineyards of the Loire Valley, great for walking or a morning run. It has two living rooms either side of a spacious kitchen. The stairs lead up from the kitchen to a beamed landing, with three bedrooms leading off it. There is a ground floor shower room with toilet, and a bathroom and separate toilet upstairs. There is ample parking for 3 cars, large garden with barbecue area. Situated midway between Château Chenonceaux & Cheverny and Chambord Chateaux, it is well placed for sightseeing, ten minutes drive from the shops & good local market. It is 20 minutes drive from the Loire River, Château Chaumont and the annual garden annual festival, Amboise and Leonardo de Vincis house. It is also a handy stopping off point halfway between the English Channel & the Dordogne region. If you're keen on horse riding - great horses, fantastic rides and facilities at the Chateau of Gué Péan 4km away. 5 hours max from the Channel: 4 to 5 hours from the cross channel ferries, (Le Havre, Caen are the closest then Dieppe & Calais). LD Lines or Brittany Ferries. Paris ORLY 1.5 hours by road. Very peaceful garden, beside the vineyards, no passing traffic. Side loading 5 kg machine. Wood stove for winter use only. fuel for sale locally. Reading material in French and English, tables and comfy chairs. 2 sofas. Upright fridge freezer in kitchen. In the summer there is an electric hob for general use. Electric oven, only in use through the summer months when the aga (stove and heating) is not needed. Large microwave with grill/broil feature. please let me know if something is needed, the kitchen is well equipped. There is kitchen table for 6 and smaller round table in the dining room. Aga cooker (for the cooler months), well equipped kitchen. Free internet and TV High-chair & cot available on demand. The staircase is steep and hazardous for young toddlers. Peaceful cul de sac in the vineyards. Very well situated for visiting the major sites of the region. Wood available for cosy, winter fire. Tennis court only 2 kms away. Horse riding easily arranged. Our quick holiday wasn't long enough! we booked last minute, I heard about it from friends who live in the region. We loved the house, quite basic, but had more than everything we needed. Jane knows the region really well so is a great help with planning visits. we were lucky with the weather so the barbecue area was greatly appreciated. We stayed here in early May 2013. We met the owner Jane and she was great (perfect English and French) with loads of ideas on things to do. The house has a nice big kitchen and the sitting rooms are nice and big as well. Bedrooms are comfortable. Huge back garden beside the vineyards for the kids to play football etc Easy to find and well located (quite rural but only a few km to nearest town) Internet connection worked perfectly. We stayed here when we visited last Easter and enjoyed the cosy home so much we decided to return again as we love the setting and its proximity to exploring the Loire. It is a clean and well equiped home with a large garden. Came here with my boyfriend last summer and loved it so much that I will be returning again this year with a group of girlfriends. The house is so comfortable and in a nice quiet are near the vineyards, and with a garden perfect for sunbathing and relaxing. It's a spacious place and would be perfect for families or larger groups, but is arranged so cosily that the two of us didn't feel at all as though we were rattling around in there! There is plenty to to in the area...many local villages with lovely French markets and local produce, as well as the Chateaus of course :-) Jane (fluent French and English!) is brilliant for getting tips on where to go and what to see. We enjoyed our time in the cottage. It is well equipped, spacious and comfortable and for a somewhat chilly week in June the Aga made the whole cottage warm and cosy. Jane and her family made us feel very welcome and even provided some toys and bits and pieces for our kids and help when our starter motor decided to play up. The garden is spacious and looks out over one of the local vineyards and the cottage is perfectly situated for visiting the major attractions of the region. The very steep stairs made it a little worrying with our very young kids but wouldn't be a problem for those with older children. All in all a well sited, quiet and comfy base for our holiday. This is a charming and spacious cottage. I visited the cottage in July 2008 with a group of friends, five of us in total. The cottage was very comfortable with plenty of bathroooms and beds for us all. The cottage is ideal for a relaxing break. Set it the midst of vineyards, the cottage is great for taking walks and sampling the local wine and goats cheese. The nearby villages of Montrichard and Pontlevoy are great to wander around and eat out in. Chateau Chenonceaux is definetly worth a visit too. I would recommend taking/hiring a car to make the most of your time. The Loire Valley is 2 hours drive SW of Paris, (55 minutes by train) the house is not far from Amboise, between Tours & Blois, on the Cher River. It is right between Chambord & Chenonceau Châteaux, so an ideal base for sightseeing, & easily accessible. The house is near Montrichard, about 15 minutes drive from Chateau Chenonceaux (a must to visit.) I will send you more directions once the booking is confirmed. Montrichard, (population 3786) is a medieval town on the river Cher, which has a river beach; is dominated by an impressive 11th century castle ruin. There is a market twice a week, banks, cinema, supermarkets & some good restaurants. Apart from good dining there are a lot of activities in the area including canoeing & boat trips on the Cher, several golf courses, a riding stables at Chateau Gué Péan, tennis courts & bicycles to rent in Montrichard. There are also some fantastic walks along the river, through the forest of Amboise or in the vineyards. Swimming is possible at Montrichard Centre Aquatique. There is fantastic fishing in the area, either in the lake 2 kms away from the house, or in the rivers Loire & Cher. A fishing permit is required which is available from the village. If you like wine you’re in the right place. The house is surrounded by vineyards, & “viticulteurs” who would be delighted & proud for you to taste their produce, red, white & rosé: cabernets & sauvignons, côts, gamays & méthode champagnisé. They’d love to take you through their cellars! <B>PLEASE don't hesitate to contact me for individual pricing, other currency payments and special offers. Supplements may apply for more than 6 people. Merci de me contacter pour un devis sur mesure et des promotions ponctuelles. Payment Euros & GB POUNDS, contacter moi pour LES ANIMAUX.